A few weeks ago, I interviewed a Millennial. I wanted to explore who he was from a generational perspective. He represents the American Dream, still alive today, I think. He talks about baseball and the Blues, of family and God, and his wife, of loving small town America, of the big and bright New York City. We also talked about education, social mobility and the future. He was all the generations rolled into one. The interview process itself, the way the process affected my writing and the art project it inspired ended up deserving its own post. The WordPress Writing 201’s the Art of the Interview was incredibly instructional on the how-to of conducting an interview. The interview was conducted over a Skype video call so I could record it with Audacity (which is free). The interviewee had wanted just to do it over Facetime on our iPhones, but I had to insist on Skype so I could record it. This was for real, man! He was a great sport about it. I then transcribed it, word for word, with Transcribe Wreally (free one week trial or $20/year). I didn’t have to toggle back and forth between a media player for the sound file and a word processor. The interview lasted just about one hour. The transcription took about 4 hours, but I was determined to at least get the words down the same night after the interview. The WordPress instructions helped me get the raw material. This is where the instructional becomes my own. The next day I went back 3 or 4 times, at different times throughout the day, editing and turning my first transcription into sentences, inserting punctuations, trying to transform the words into units representing what he said. Trying to remember the cadence of his speech, the intonation of his words. I focused more and more each edit on the words he used and how they are different than mine. He speaks in short sentences. So many editing versions later, I felt like I’d put on someone else’s writing voice. The over 5000 words really allowed for immersion in someone else’s voice. I felt like I was swimming in it. Since then, I’ve noticed his speech patterns migrate over into some of my own writing, like the first stanza in the sonnet A Curtain Drops. His short and simple statement, “I like music” was a refrain. I was so glad to be able to capture the talk about work. I never know what anyone does nowadays and find that the elevator pitch doesn’t help me really know. So, I asked him to describe his day to day and got the modern business speech lexicon that I find I want to preserve somehow. It’s the mundane that gets lost. I love the two times he uses the word “bubble.” I talked to his wife about that all psychologically. I thought it was surprising his use of the words. First he uses it to say he wanted to go to college somewhere outside the Southern bubble. And, towards the end, he imagines that people 100 years from now will be living in protective bubbles because we’ll have destroyed the earth. Southern bubble sounded pejorative but then it struck me in his second use that for him a bubble is protective – it keeps things out in a good way. His wife told me it’s just the word he uses to talk about containers! I also wished that I could have embedded in the post a sound file for the intonation of his voice or even video when he said, “There’s a gazillion things wrong with this world.” It was at the end of our hour allotted period and I really felt like I’d gotten to the bottom of something. It was like as though the more he spoke in the interview, the more the extraneous things fell away and he was naked then, at that point. It was the perfect way to end the interview. I’m not an artist, though about 12 years earlier, I had a vision of a piece of art illustrating a concept that was informed by the circumstances in my life at that time and a philosophy I was immersed in and trying to grasp. It also was a mosaic. At that time, I had no idea how to go about realizing the vision, so I didn’t. I don’t know what the internet was like then because I didn’t use it much to search, being on the cusp between Generation X and Millennial. However, nowadays, after making the jump, long after most of my friends, from a blackberry to an iPhone, that technology has changed my life. A legitimate generation X’er I know, who loves Madonna, and that’s the one main thing you could say about him, told me as much when I was making the switch and I scoffed. I do stand corrected. 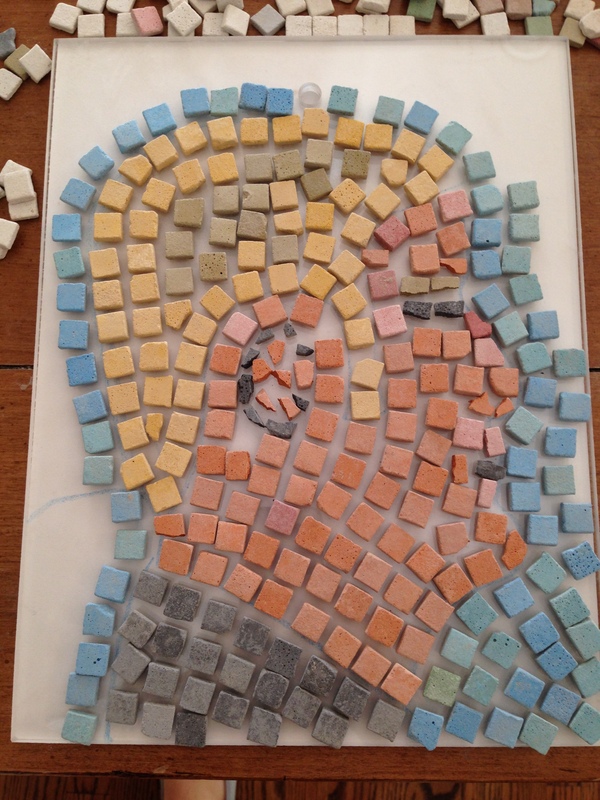 Anyway, I googled “how to make a mosaic.” I read through it, including the handy links to the supplies on an art store website. I then went to my Amazon app (thank you Prime) and ordered an acrylic 8×11 transparent mosaic base, mosaic stones for children, mosaic grout and mosaic adhesive. All the materials cost about $40. I’d wanted a wooden mosaic base, but I could not find one right away. The part that gave me anxiety was cutting mosaic stones and having to get a stone cutter and goggles. The children mosaic stones could be cut with scissors. They worked out great. The whole exercise took maybe 20 minutes. The supplies came through Prime 2 days later and last weekend I did my art project. My son accompanied me. 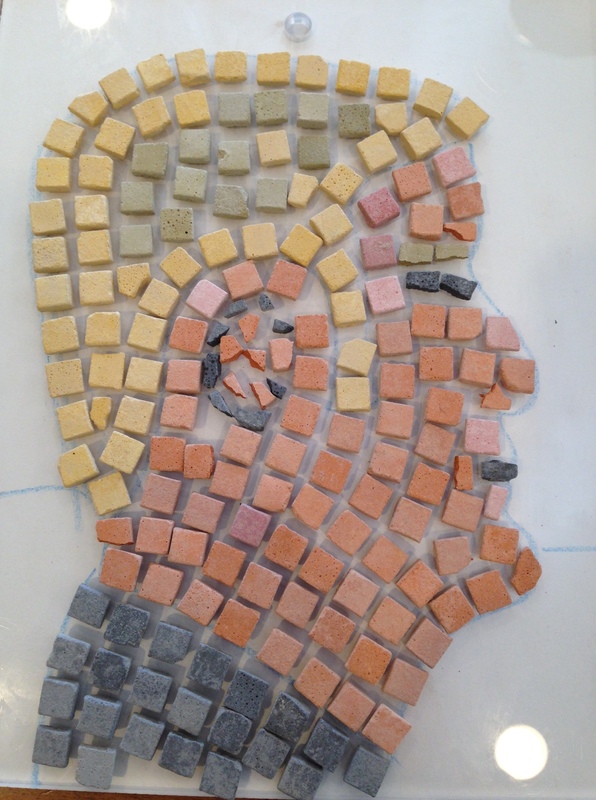 We shared the mosaic stones and adhesive and he used a paper plate as a base. My daughter crawled around at our feet. My husband was the audience. I had asked my interviewee’s wife to send me a selfie of his. She sent me several. I chose one where he was facing front, editing it to pull his face up as big as possible. I started the project around 11:30 a.m. on Saturday. I printed it to our home printer, but I could not get it to 8×11 to match the size of my acrylic base. I got my son’s sketch pad and drew a crude outline with a blue crayon of the Millennial’s face and features. 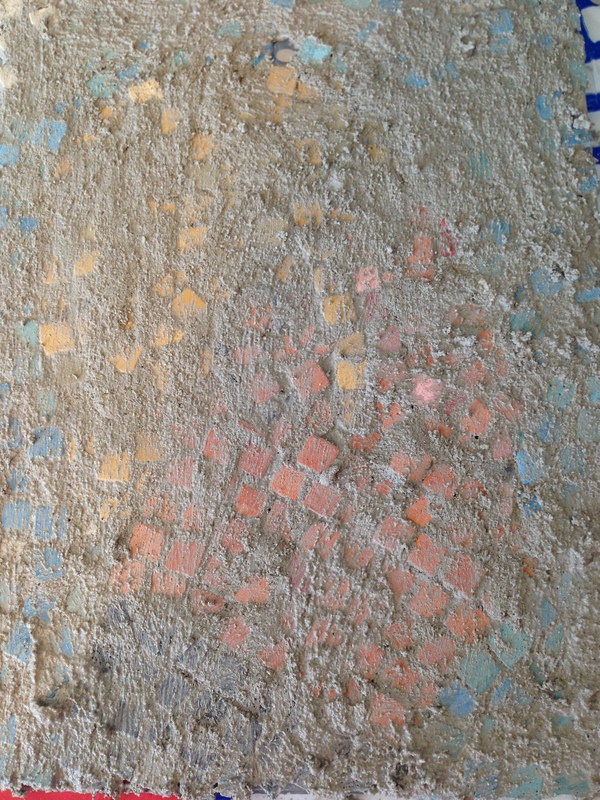 I dumped out the mosaic stones, sifting through, getting to know the colors. They weren’t bad. I had imagined glossy, these weren’t glossy, but good enough. I started to arrange them on the acrylic base. It wouldn’t work. 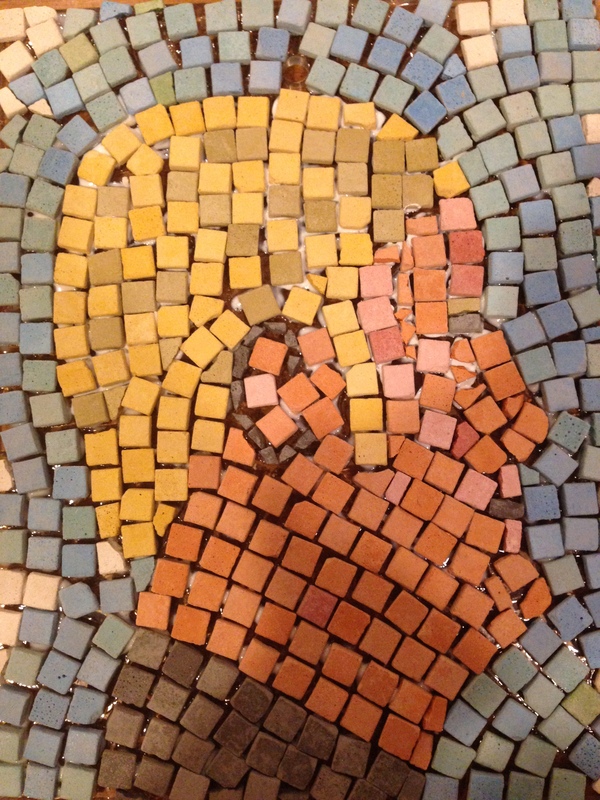 For my first mosaic project, I would not be able to cut the stones and create human features on a face and finish this lifetime. I texted his wife to send me a picture of him from the side. They were on a road trip and he was driving. She sent it to me right away. I cropped it, printed it, did a crude sketch of it and slid it underneath the acrylic base. Much better. The pattern was simple enough for my first mosaic. I arranged the tiles first. I spaced them fairly far apart. I really liked how it looked. I laid them all down, taking pictures along the way, afraid they would all disappear with one accidental misstep from my son or my baby daughter. I hate doing things for the first time. I feel rushed and irritable. And when things don’t look right, like with my first pattern, I feel utterly despondent. 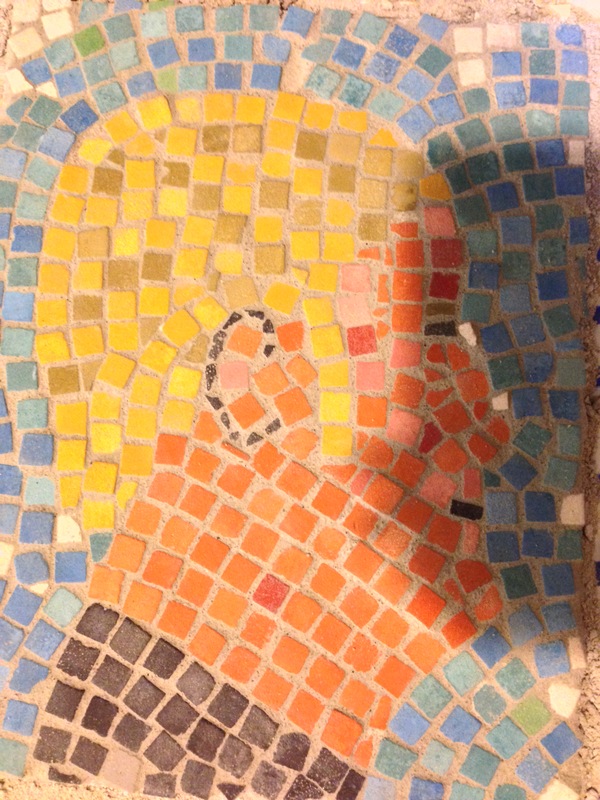 I said as much to my husband and my son who was working on his mosaic right next to me, looked up surprised and said “Hey! Me too!” I laughed. Yes, we have that in common, or I am just like a 4 year old, whether related to me or not. Then, I felt frozen. How would I do the adhesive? It had taken me hours to arrange the mosaic tiles. I could not brush the base clean and start over again. I decided to do 3×3 inches at a time. 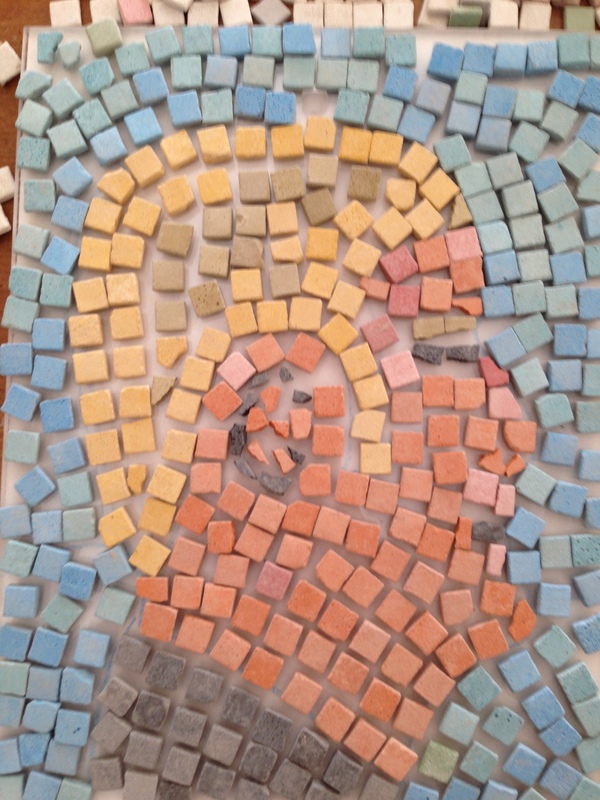 I started with the bottom right corner, removing the tiles, setting the adhesive and putting the stones down. I went like that, up the right side, it took 4 batches to get up the right side. Then, I went haphazardly picking where I wanted to go, to what seemed easy and fun, but staying at the edges. I was terrified still that the pieces would go flying and was creating a safe boundary for the middle pieces, his face and hair. I was conflicted about the face, the nose especially. Once I got through the neck and the hair I had to start breaking tile as the space between tiles got smaller and there was nowhere to shift. I got nervous with the nose and around the eyes, there were so many small pieces. I finished laying the tiles around 5 p.m. I’d taken breaks throughout the day, it probably took about 4 hours. The instructions are that the adhesive had to set for at least 6 hours so I stepped away from the project after 5 p.m. It was hard. I take taken pictures and kept looking at them and saw that the nose was all wrong. I wanted to go back downstairs that night from my bed, like a plastic surgeon, and take a chisel and hammer to the blocky nose, but I restrained myself. The next morning first thing, I took to it. Our fancy Wusthuf knife was too flimsy. I took our heavy duty scissors and chipped away. By this time, I felt a pro at breaking the stones with scissors and started putting chips into the spaces, trying to block out all light. I waited until the house was a little more empty and it was just me and my baby girl in the house. I was at a loss for how to spread the grout. Never having paid attention to my husband’s DIY T.V. addiction, I felt regret, my exaggerated despondence. I went to YouTube and searched for “how to spread grout.” A long instructional video came on, I couldn’t with it, so I went to another that was 5 minutes and showed me exactly what to do. The grout package was small. I was worried I would not get the consistency right. It was like toothpaste consistency, just right, then I added too much water and had no more grout left. I googled “how to thicken grout.” I should have added with household products, so got silicon. Nope. I despaired. Do I call my husband to pick up more grout? Then, I wouldn’t have the quiet house. And, I would never finish. Suddenly, I saw something about how if the space between the grout was very small, only thin grout mixture would be able to seep in. That’s me! 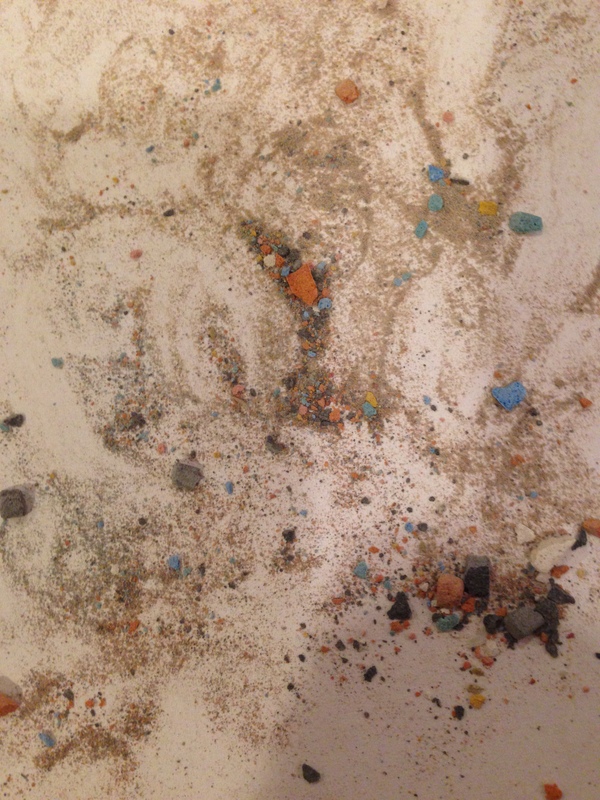 I thought and started dumping the mixture all over the mosaic stone. It felt so wrong to do it and it felt so good to feel so wrong and have it be right. I used one of my son’s painting brushes and this part ended up being so satisfyingly fun. I brushed and brushed and brushed the grout watching it seep in and watching messy grey grout all over the beautiful mosaic stones. I was gleeful, exuberant. My little daughter was all over the kitchen, crawling on her belly, getting into everything. We were both in our element. I kept thinking to an old neighbor we had, Ellen, the only artist I’d ever known. I’d thought her house was messy with art supplies everywhere. I was Ellen today. I let it set for 15 minutes. By that time, our house guests had come back from lunch so I took the baby out to play on the trampoline with them. We have fun house guests. I came back in dying to start wiping the excess grout off the stones. I used a damp kitchen towel and lovingly wiped and wiped and wiped. Then, I used a car buffing towel of my husband’s and continued. I felt like I feel when I’m shampooing one of my baby’s little heads. I could have done it forever. The satisfaction of seeing the mosaic stone color come through was red and deep. Throughout the rest of the day, I would walk over to that corner of the kitchen and polish the stones a little more. I liked it. I really liked it. HOW DID I GO OFF THE DEEP END? Interview to art project, how did I get here? From never having willingly done an art project to all of a sudden doing one like it might be the last thing I ever do on this earth? I have a theory. I watched my son for 2 years color through hundreds of coloring books. Day in and day out, he would color. My husband, mostly, would color with him. Sometimes my son wanted to watch you color. He would also paint on his easel, draw with chalk on chalkboard or the pavement. He would cut and make crafts, but mostly he would color with crayons, these cool new fangled style crayons that don’t break when you grip them too hard, which he did. His little muscles got strong from how hard he would color. I marveled, really, at how he did this. He didn’t care if he was good, or in the lines or anything. He colored with so much force and dedication. He colored in the morning, he colored in the night, and according to the au pair he would color during the day too. For over two years that kid colored his heart out. We estimated that sometimes he would color 6 hours a day. But, I think it began before. When he was 2 we discovered puzzles on the iPad. For about 3-4 months he wanted to watch us do the puzzles. We would do the puzzles in the morning and at night. Then, all of a sudden after months of watching he started to do the puzzles himself as though he’d been doing them all along. I did puzzles for him, and he colored for me. I started my first art project ever with the force with which he left off coloring. The power of watching someone do something is incredible. The power of putting on someone else’s voice is incredible. What’s fun about all of the creative stuff is I only do what I want. How amazing. I can cut the kid tiles now and can make more intricate designs. I have the next design in mind already. It has to do with a pig and a ton of shrimp.